Not too long ago, we wrote about the many ways VR360 video can be consumed. Today we’re going to look a little behind the scenes at how we produce VR360 video content. VR360 video, at its core, utilizes multiple conventional cameras in a fixed position to capture a full 360-degree sphere of video. This requires a minimum of two cameras and up to as many as you can fit, as space allows. Special consideration must be given for creating three dimensional (3D) VR360 video content, requiring purpose built cameras and a complicated post-production process to deliver the highest quality experience. As the ways to consume VR360 video content has exploded, so too has the ways to produce it. Mittera employs a variety of cameras to achieve our customers’ goals and messaging needs. Our video studio uses the Nokia OZO and the Z CAM S1 to produce our VR360 content. These are some of the best cameras in the industry and deliver dependable high-quality video every time. 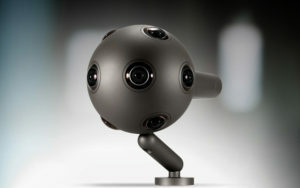 The Nokia OZO is one of the best cameras in the industry, designed specifically for VR360 video content. It features eight 2K-by-2K sensors that capture RAW images, allowing us to consistently deliver the best picture possible to our customers. It offers stunning cinematic visuals with an immense level of control during our shoot and in post-production. Not having to constantly check the cameras are synchronized makes the OZO highly dependable and allows us to focus on creating a great message for our clients. Additionally, the OZO is one of the few cameras to deliver 3D stereoscopic content, which allows for the ultimate in immersive VR360 experiences. If the Nokia OZO is a cinematic battleship, the Z CAM S1 is a fast runabout. The Z CAM S1 is about the size of a 20-oz. water bottle, but its small size packs a big performance with four 4K sensors that deliver a cinematic punch. The diminutive size of the Z CAM S1 allows us to mount it in a variety of spaces; on top of forklifts, riding along conveyor belts, and inside race cars. Just like the client will vary, so too will the cameras we use for a given project. We use both of our cameras together often to craft the best message for our clients. That’s why we often shoot conventional video and produce 3D motion graphics to insert into our VR360 videos. But the acquisition of video is only a part of the process. The real magic happens in post-production when we stitch, render, and edit the videos together. Each lens records a 180-degree fisheye perspective. We load these images into our stitching suite that uses models based on our cameras to interpret the footage and assemble everything together. We use Motionflow technology to predict, analyze, and create pixels that are moving in between the lenses of the cameras. Our highest quality renders take about 30 minutes of rendering time for 10 seconds of video playback. To combat this, we enlist a fleet of computers to render little bits at a time, which allows us to quickly turnaround VR360 video to our clients. After the stitch and render, we can manually adjust the stitch as necessary and color correct the video to ensure the highest quality image and that meet the look our clients are seeking. From there we treat the content as traditional video and edit, add music and graphics, and share with our clients for feedback and their edits. No matter the technology, our goal is the same: to create meaningful and effective marketing messages for our clients.